Firefighters are exposed to the most hazardous of situations and greatest risk activities during emergency scene operations. To ensure that firefighters do not become victims, the Assistant Chief as Incident Commander must engage in the operations, recognize the hazards and address them in a proactive manner. 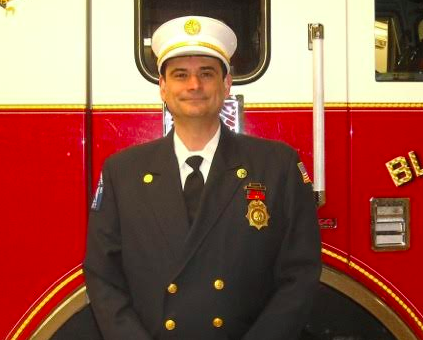 “Some of the firefighting training in Blauvelt and the Fire Training Center involve learning about electrical hazards during an incident, functions of the fire pumper and winter weather firefighting procedures,” he continued. As the fire systematically destroys the structure and firefighters open up walls and ceilings, electrical wires become exposed. Being able to quickly control the power minimizes the possibility that crews working inside the building will touch energized wires that could shock them. Shutting off the power may also help stabilize the incident if the problem comes from a malfunctioning electrical appliance or distribution system. If the electrical service is being fed from overhead lines, there is always a chance that live wires can fall to the ground. This is dangerous, because in heavy smoke conditions or while wearing a self-contained breathing apparatus (SCBA) face piece, it can be difficult for the firefighter to see the fallen wires. The setting of an aluminum ladder to a window or rooftop by firefighters in reduced visibility may result in coming into contact with a live wire. During a flood, a hazardous flow of electric current can occur from submerged or damaged electrical equipment and the risk of electrocution from water damaged appliances. To ensure safety, the power company must disconnect the grid-feed meter before the firefighters enter the building. During the cleanup phase, possible electrical hazards include using powered hand tools in a wet environment. A fire engine, also known as a fire pumper, carries many feet of fire hose, nozzles, hose couplings and equipment. It also carries 500 gallons of water for a quick attack on a fire, which is critical to fire control until a dedicated water supply can be established from a fire hydrant. The nozzle team checks that there is no hang-up of the hose, and that it supports the weight of the hose and enters the door of the structure to extinguish the seat of the fire, while other fire companies look for victims. The plan is to open walls, ceilings and partitions to prevent fire extension, plus save living space and interior stairs. Training procedures include removing the right amount of hose or lead length from the apparatus, carrying the hose effectively on the shoulder or arm, flaking or stacking the hose line and knowing when to charge the line with water. With winter conditions present in March, the fire service must contend with demands due to heavy snowfall and extreme temperature conditions. Cold weather contributes to road conditions that increase the risk that firefighters are exposed to. Drivers must make certain that they are familiar with the operations of window defrosters, heat vents and brakes on their particular fire apparatus. Increased stopping distances, decreased visibility and the unpredictable actions of civilian motorists can be expected and can have a negative impact on response. Engine companies will need to keep water moving to keep hose lines, ladder pipes, valves and pumps from freezing solid. Slips and falls are another widespread hazard during cold weather operations. The soles of many firefighting boots worn are harder in cold temperatures, preventing them from ‘gripping’ the ground. One of the ways of protecting firefighters from cold stress is through proper hydration. During work cycles, it is recommended that a firefighter drink at least a quart of water per hour. Most often the hands, feet ears and face of a firefighter are most prone to frostbite and will be accompanied by numbness and stiffness to the affected areas. The best way to prevent frostbite is to protect the skin from direct exposure to cold air. For additional information about volunteering, call 845-359-8401 or visit www.blauveltfire.org.